"A beautiful island, with a vibrant nightlife, great food and interesting history, its sandy beaches are famous for their high-quality and beautiful turquoise waters. " A cool and trendy Greek island, offering a vibrant nightlife and gorgeous sandy beaches, it is the perfect place for anyone who wants a fun summer holiday, close to crystalline waters. 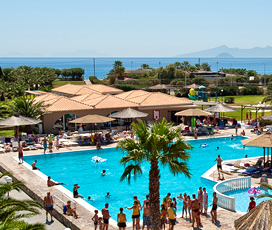 Kos enjoys a beautiful, temperate climate, with warm weather that never drops below 20 degrees throughout the summer. This makes it ideal for people who want a traditional beach holiday, and there is also a vast array of fun watersports available on the island. Then, when day turns to night, places on Kos become a hub for those looking for an exciting night scene. 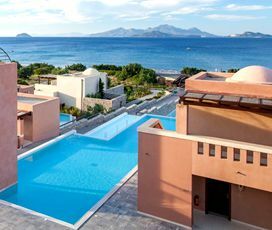 However, there are also quieter places, ideal for family holidays, ensuring that Kos has something for everyone. The long history of Kos Island is depicted in the many archaeological sites on the island, including the Ancient Agora, Casa Romana, the Castle of Antimachia, Neratzia Castle right above the port of Kos Town and certain must see is the Asklepieion, the most important healing centre in the ancient times. In fact, tradition says that Hippocrates, the father of medicine, used to heal people in this Asklepieion, one of the many that existed in Greece. ature to be found inland, with rolling hills and steep cliffs commonplace. 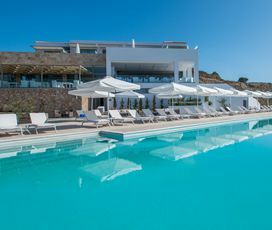 This all serves to make Kos the ideal island for people looking for a classic beach holiday, with the option to have fun and venture out or relax in a comfortable and beautiful setting. Making up one of the 12 islands in Greece’s Dodecanese islands, it is located in the Aegean Sea, has a long coastline and stretches 112 kilometres from west to east. The main town on the island is also called Kos, containing a port and a variety of nice bars and restaurants. 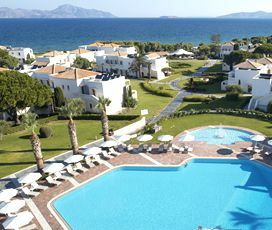 Kos is known for its golden sandy beaches and numerous Roman and Greek landmarks. 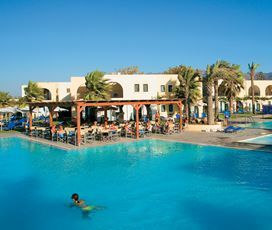 Kos enjoys a hot Mediterranean climate with warm summers and mild winters. 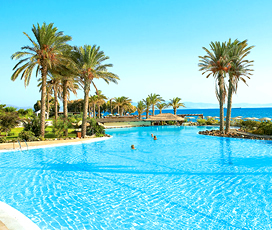 The best time to visit if you are a sun-worshipper is August when the temperatures average 29 degrees and rarely drop below 21. June, July and September also have hot weather and are ideal for relaxing on the beach. 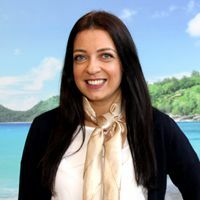 Kos often experiences Indian summers, lasting long into October, although by then the average temperature will have dropped to the high-teens low twenties. The winter months can often be wet, although this period is short lasting from December to February, with warmer dryer weather returning in March. Posa cheese or wine-cheese, is one of Kos’ most famous foods, it is prepared by allowing local goat cheese to mature submerged in red wine, giving it a salty, fruity flavour, which visitors are sure to enjoy. Pitaridia is a Greek version of lasagne, which is often eaten at festivals or weddings. Kanelada is the traditional drink of the island, made out of cinnamon and tea, while Kos is also famous for its large selection of delicious local wines. The best place to enjoy the many authentic the delights that the island has to offer, is the rustic tavernas, the ideal place to dine with friends, family or your significant other. Family holidays on the island are ideal, as you can imagine combining stunning natural beauty, azure seas and an array of other fun family activities. 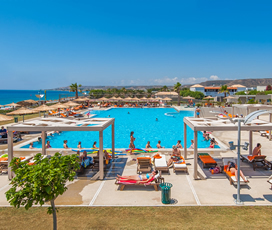 There is a waterpark in Mastichari, ideal for a day of aquatic fun for all ages. 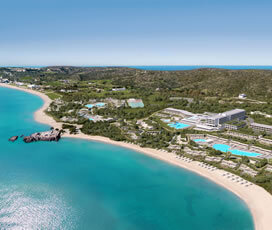 Along with beachside clubs, offering lessons in watersports, sailing and other activities. Kos is also the perfect place to try horse riding, with a large number of stables on the island providing fun hacks amid beautiful natural scenery. With a great selection of natural beaches, visitors should not miss catching some rays at Lambi and Mylos beach, both equipped with golden sands and azure waters as far as the eye can see. It also has a rich set of historical locations, including a castle that was inhabited by the famous Knights of St. John and the tree of Hippocrates, the father of modern medicine. Outside of the main town, a busy tourist location, there is a host of peaceful natural places and rustic villages, ideal for adventurous explorers, who love to enjoy the great outdoors. There is a wine festival held in Mastichari Village, in the first week of August, which is the perfect way to sample the many delicious wines produced on the island. The Hippokrateia Festival is the most important event on Kos, and begins with a reading of the famous Hippocratic Oath, featuring concerts, theatrical performances, ancient tragedies and traditional dances. If you are looking for evening entertainment then the most famous area to venture out to is situated right at the heart of the capital, where the streets are lined with a myriad of bars and clubs hosting a large range of music, including rock, jazz, blues and pop. 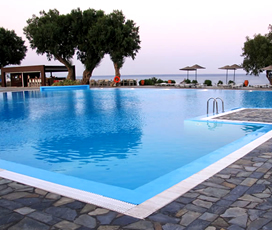 The resort of Kardemena is located slightly further away from the city centre and is very popular with British tourists. Those looking for something quieter, will be able to find it, in the many smaller villages that populate the island, consisting of smaller bars and local cafes, enjoyed by the many locals.